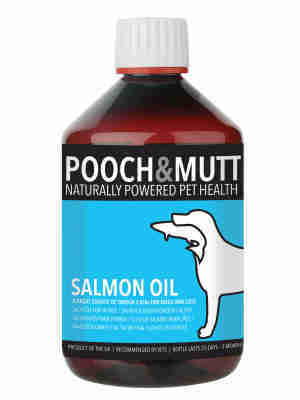 Pooch & Mutt Salmon Oil Omega 3 supplement for dogs is sustainably sourced from Atlantic Salmon reared in Scottish sea lochs under carefully controlled, natural and environmentally compatible conditions. The salmon oil has a rich taste that dogs (and cats) love. An increase in the quality of your pets coat and skin, leaving it feel luxurious and full. Boost the immune response, helping your pet to effectively fight off illness. Healthy brain and heart function. Low Levels of Omega 6. Correct 4:1 ratio of Omega 3:6. Added Antioxidants so that the bottle stays fresh for longer. Thank you I have received my order and I am very pleased with the way it was delivered. the products as usual are of a good qality. My dog has always had a skin condition and has been on numerous tablets including steriods from the vet which has been very costly over the years. I saw this salmon oil and thought it won't hurt to try it out. Tammy has been having this with her food over the past three weeks and her hair is starting to grow on her back where she had rubbed it off. I hope this progress will continue, I will definitely continue with this treatment as long as improvement is made. Tammy also seems calmer in herself as she is not rubbing her back or nibbling her legs as much as she used to. Our Westie is over 11 yrs of age and her coat and general condition was showing her age, I can honestly say within 2 weeks of giving her Salmon Oil you could see a difference in her and after 4 we were getting comments on how she appeared to have a new lease of life and to the improvement of the condition of her coat.Would recommend it to anyone however old the dog as it makes such a difference.